The year was 1997. Bill Clinton was in the White House. The Spice Girls were topping the pop-charts. People were still watching TV shows on NBC. And I was entering the corporate world. There I was, selling radio ads at a local Detroit radio station wearing a suit everyday …the same suit …every day. Hey, don’t laugh. I wasn’t going to charge suits on a credit card. 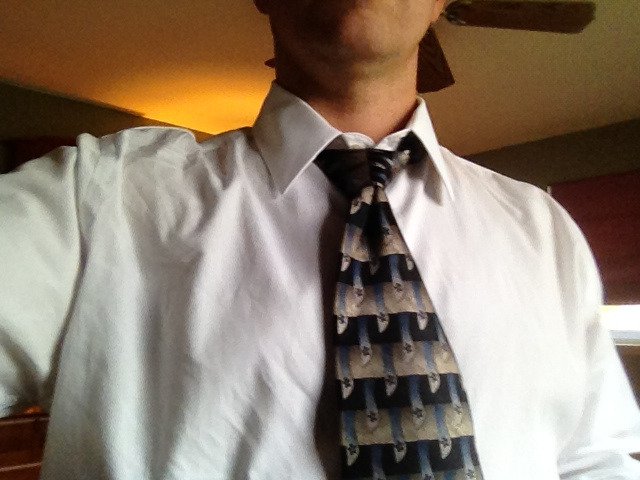 So, here’s one of those ties that’s still in my collection 15 years later. Is it a great tie? Is it a brand I recognize? No. But it’s khaki, blue, grey, and black, which means it goes with everything, and everytime I purge the ol’ tie rack, I still can’t part with it. Epilogue: Lest you think this guy was a total a-hole, he wasn’t. Turned out he was just a really funny, really nice guy and he never changed, and some of the ties he gave me still had tags and were brand new so I kinda think he bought them for me as a gesture of kindness. He retired recently and he went out with a great reputation, on his terms, and seemed genuinely happy. Not a bad thing to strive for. Hmmm …maybe I’ll go find some young whipper-snapper around him, insult his ties, and carry on the tradition by buying him some ties and helping him get started. Follow me @donkowalewski or ‘Like’ my pop-culture TV page, spunkybean: http://www.facebook.com/Like.spunkybean. Or follow my Tumblr blog.